We started with just one spectabilis and now have there large ones through division as they die down other plants cover over them. We also have a low spreading one with grey leaves and pink bell like flowers that I think is a formosa. It's just left to its own devices and spreads about in a shady area. We did have a white one but I'm not sure that is still around. You can tell if its formosa if it has rhizomes. I would not like to venture any further identification. Glad to hear you have propagated your spectabilis by division.I wonder if you used a spade as I do. Yours seem to be thriving on neglect like the ones in France. Very benign neglect of course! You have worked very hard on this post Roger. It is most informative. D. spectabilis did very well in my old garden and would spread (would come up 3 or 4 feet from the mother plant). We also had Dicentra cucullaria that would appear in various corners. 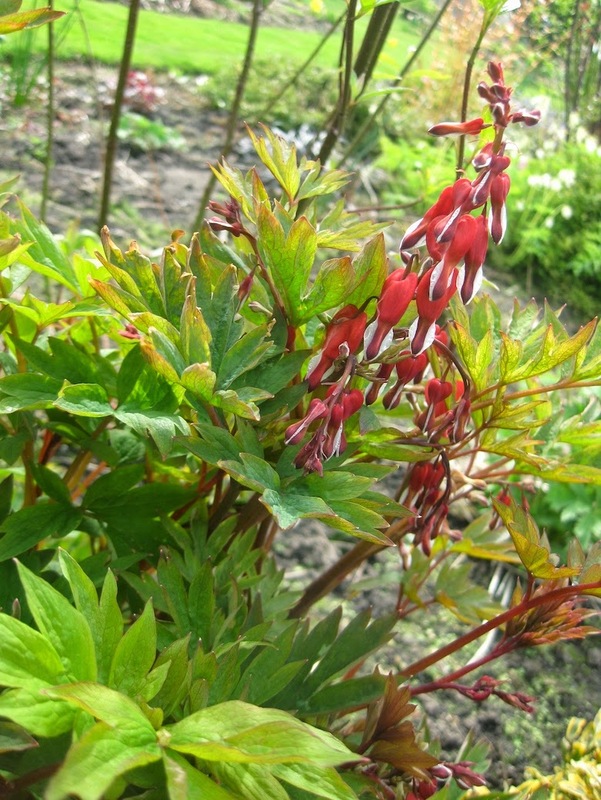 I was surprised to read that Dicentra are damaged by late frosts in Yorkshire. Here spring comes so late that by the time they are up all danger of frost is over. They do not like my present garden. I took one over that survived only a few years. Strangely enough, in the forest, the local Dicentra is canadensis, you never see the cucullaria. I struggle with Dicentra canadensis and mine rarely flower. The biggest pleasure I get is if I repot them and see the cute tubers which look like sweet corn. Do you call it squirrel corn in your parts? 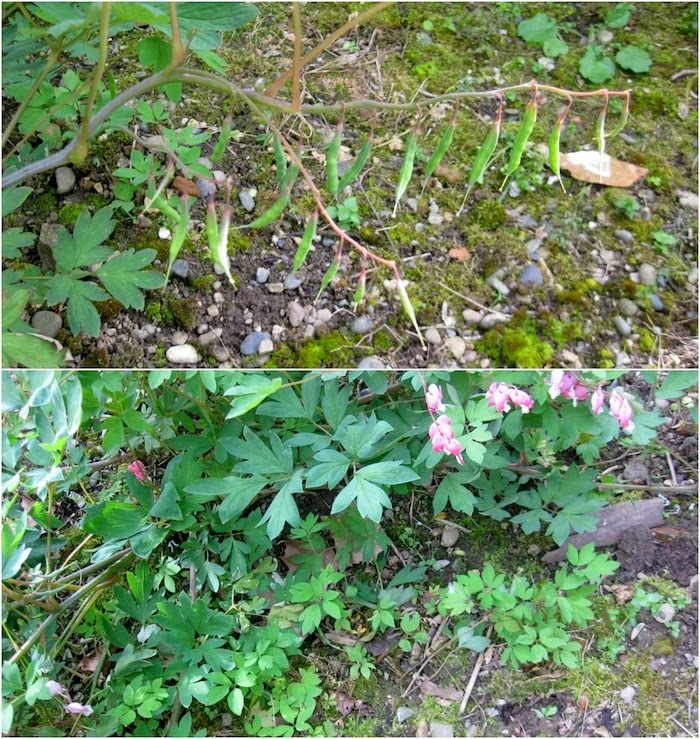 I have grown Dicentra spectabilis and spectabilis alba in the past but we seem to have drifted apart. I was tempted to buy one in a recent plant sale I attended but did not succumb, in fact I didn't buy anything! 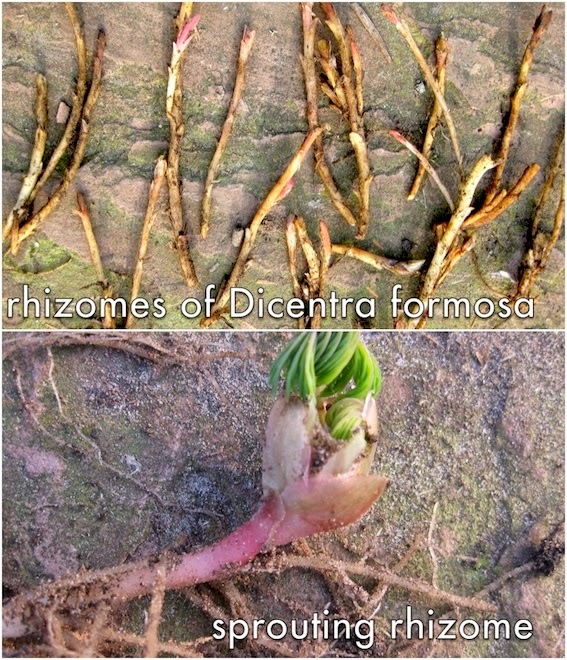 Your comments about the description of roots as tubers do not surprise me, there does seem to be a great deal of misinformation about in horticultural literature, I do wonder where it comes from, maybe it is perpetuated by people who have never actually seen a Dicentra root but just read about it in a book. Pleased to hear Parker's Bulbs came up trumps for you, although I have had some Impatiens plugs from them this year, I had not bought from them in a while after having some bad experiences. Go on treat yourself Rick! I don't go so far to claim the spectabilis root is a tuber, just that it's a darned sight nearer than a rhizome. Sorry Roger, my mistake I meant rhizomes, I read it through so many times I had myself confused! I can see from you own nice blog that you will love dicentras! Thanks for this informative post. I have just been given a gift of a dicentra gold heart, still in its pot, fresh from the garden centre. Is it ok to plant it out now, in September? It looks lovely right now, lots of tender new growth, but I'm wondering if it will almost immediately die back (and if that matters?) Thanks very much! It will die back very soon Anon. All of mine are now completely dormant except one that made new growth in my greenhouse after recovering from an earlier check. Now is a very good time to plant but is also a time when it might be sensitive to overwatering as it becomes dormant. By all means water it in if it is dry but the perhaps no more. Ok that's great, I will plant it tomorrow. Thanks very much for the advice! Something that looks like dicentra (flowers, anyway) has appeared in the middle of the box hedge. It is already 24" tall and has simple pinnate leaves with serrated edges. There is only one flower at present and it's deep red. It looks like an invasive shrub which recently took over the borders of a nearby car park. What is it please? I am going to pull it out because in the present location it is a weed. There is deep red veining in the leaves and stems; could I use it for natural dyeing? I found your blog - which I have greatly enjoyed diving about in – while looking for information about the nature of Dicentra ‘roots’(!) and I too prefer to stick to this plant’s more graceful name. My 12 year old labrador has spent his life gardening with me and has never shown the slightest inclination to interfere with anything other than carrots and beetroot which I did have to keep him away from to stop them being dug up. Yesterday I moved a Dicentra spectabilis from the middle of a bed where he would not have ventured to beside a path where he likes to lie. I was astonished to come out later to find that he had been excavating. Something he has never otherwise done. I am a fan of bone meal to encourage rooting and assumed that somehow this had got to him for the first time after all these years. He got a row but the same thing happened again a few hours later and I realised that very little of the roots was left. I was really surprised given his previously impeccable record. However, overnight, he was unable to contain himself (luckily he lives in an outdoor building!) and this morning I was greeted with coal black faeces which were repeated as we went out for a walk this morning. Not to put too fine a point on it, the same as a human after being given iron tablets. I wondered if you had ever heard of the roots being irresistible to dogs? What is left of the plant is now back where it came from! Grateful for any insights this may prompt. Your absence of bad news in your e mail giving me permission to publish this is good news Joan! Dicentras contain a natural toxin. 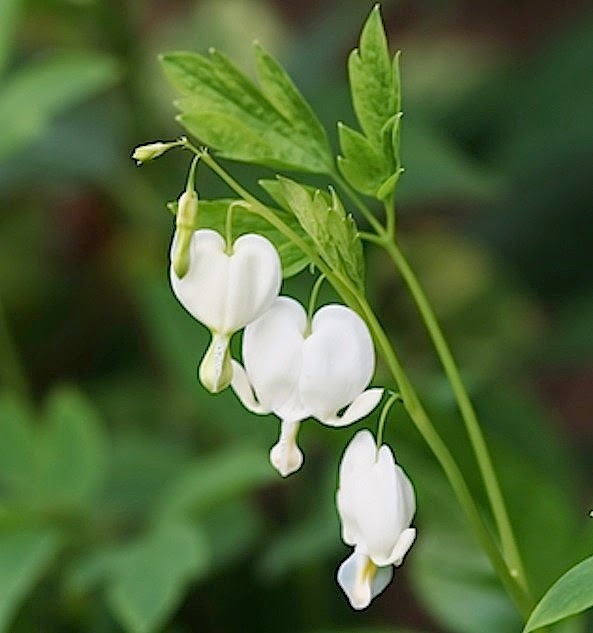 The Americans call several dicentras including Bleeding Heart 'staggerweed' as a result of their effect on grazing cattle. Perhaps the irresistibility of the roots to your labrador is that he is getting some kind of 'high'. I think your dog will be alright but perhaps for his health and the health of the root depleted dicentra you perhaps should lift it and put the plant(!) into convalescence in pots and perhaps put them in a protected place such as greenhouse. Serve you right for prompting your dog excavating as a result of your bonemeal. Just joking, Joan.You can read my post about what I think of bonemeal! PS they are actually roots on Bleeding Heart and not rhizomes as with Dicentra formosa! The dog has definitely not suffered in any way, I'm glad to say. As to my lifetime devotion to bonemeal learnt at the knee of a wonderful head gardener, I'll have to think hard about that now! Many gardeners better than me use bonemeal.Old gardener's passed its use on and modern gardeners are inundated with pundits who don't know better. Soils before the use of fertilisers were deficient in phosphate and in the old days with less intense extraction from bones they might have held up to 4%nitrogen which was useful. January is the time for reviews. There is something about Dicentras that really appeal to me. In this article I have found your planting them amongst other perennials and shrubs useful as that means I do have room for them in my rather small garden. I shall on the look out for Fringed Bleeding heart that I left behind in my last garden.